Sometimes the smart thing to do is to throw out the plan. 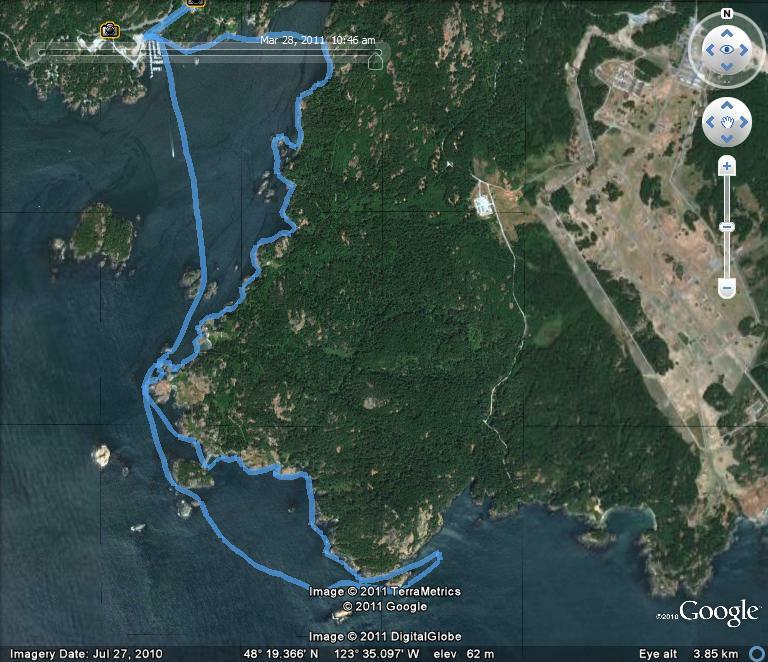 Sunday we'd planned to do a one way paddle from Weirs Beach to Becher Bay. One way trips are unusual here in Victoria. Out and backs are easy to plan and execute. Out and backs also seem to fall into clock management. Even with it's high number of retirees people in Victoria like most others are covered by the clock. For this trip we threw out the clock and planned to paddle the tides. We hoped to ride the ebb winds all the way. Unfortunately the wind conditions warranted a rethink and we tossed out the plan and launched from Becher Bay marina headed out to the DND property then retraced our path back to the marina. Becher Bay is a wonderful destination and I'm surprised it's not on more peoples top list of sites to paddle around Victoria. Lots of rock gardens to play in,especially on the east shore. In fact I'll be repairing nice gel coat hole later today. It was a great day to be on the water. We covered 6.64Nm out top speed was 5.9 Kt, we paddled 2hr 23 min, with a moving avg of 2.8 kt.s and stopped to 1hr 20 min. which reduced our overall avg spd to a breath taking 1.8 kts. Stopped time and overall averages are essentially useless bits of information as the stop time includes everything from the time I turn the GPS on when loading until the time I remember to shut it off. Usually one of the last things I do after returning home.